Play as Detective Gumball, the world's greatest homicide detective, and solve the murder of a wealthy socialite. The suspects are full of secrets, but none so much as the victim himself. This game was made for the February 2018 Bitsy Jam: oh no. Music credits: Clock Tower on the SNES - "Don't Cry Jennifer Theme"
Character portraits implemented using ruin's "Image to Bitsy" tool. This is absolutely amazing! From the music to the graphics to the humor, this is A+! omg this is so good!!!! 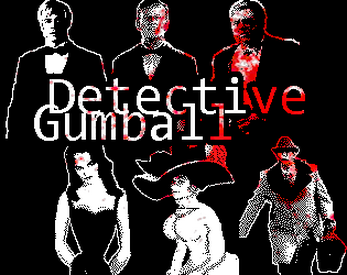 i'm so glad someone made a detective game!! i tried like 10 diff combinations and tried some ppl a couple of times with diff weapons and motives and i love how many diff slightly changed dialogues you made!!!! this was so much fun and the portraits looks great! honestly just super duper love this game!! !